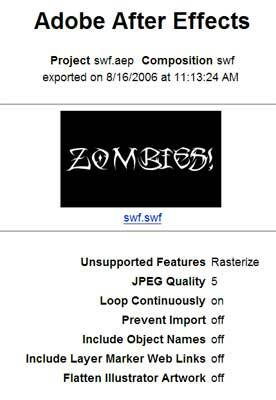 After Effects to Flash, with Zombies! DMNForum has an intro tutorial on exporting from After Effects to Flash. If you’re running a SWF aware VJ app such as Motion Dive, ArKaos or Resolume, and are yet to dip your toe into the ocean of sweet, sweet vectors, this could help you deliver smaller filesizes and higher quality than exporting shape based video to lossy formats. If your VJ app of choice doesn’t support SWF then look to the web: For those presenting their video online who are as sick of Youtube’s horrible compression and clip loading issues as I am, this may be a reasonable alternative. I shot some more plotter video over the weekend, so I’ll post it in FLV format as an example. And whaddayaknow, Flash 8’s new video codec supports alpha channels, so when our eventual FLV clip is played back in Flash, the channel information will have made the journey. To make sure this happens, though, we need to press the Advanced Settings button when we go to export the FLV, which will reveal the Encode alpha channel option (fig. 6). Once that option has been ticked, we can then export away. I’m not sure which VJ apps (if any) support alpha in flash, but the idea makes me happy all over. If anyone knows about this, or if there are any flash aware programs I’ve missed, hit the comments. If you’d like some premade flash clips to test out, check TriggerMotion’s fileshare page.